In this paper we consider the case of a functionally graded heat-conducting hollowed cylinder. Our purpose is to investigate the consequences of the material inhomogeneity on the decay of Saint-Venant end effects in the case of linear isotropic rigid solids. The mathematical issues involve the implications of spatial inhomogeneity on the decay rates of solutions to Dirichlet boundary-value problems. The rate of decay is characterized in terms of the smallest eigenvalue of a Sturm–Liouville problem. We first consider the case where the inhomogeneity depends on the radius of the cross-section, but later we also consider the case where the inhomogeneity also depends on the axial variable. The last section considers the case where the cross-section is increasing. Some tables and figures illustrate our estimates. 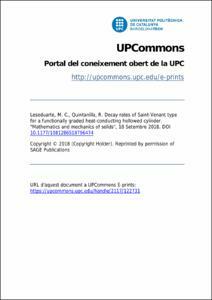 Leseduarte, M. C., Quintanilla, R. Decay rates of Saint-Venant type for a functionally graded heat-conducting hollowed cylinder. "Mathematics and mechanics of solids", 18 Setembre 2018.